Having the winter blue’s or the sock blues. Knit and purl stitches forms a very appealing pattern all over the fabric. This is my second toe up and the second sock tested by Irene. This is how Irene changed the pattern to suit her. Great job. Since I had a different idea in mind am changing the pattern multiple so it is symmterical and take the pattern all the way down the instep. To fit size 9 woman’s feet, length can be adjusted in foot area for a larger size. Sl 1: Slip 1 st purlwise. KCGS: Slip next st knitwise. Insert right needle purlwise in the right leg of the stitch on row below slipped st on the left needle. Insert left needle point in front of first two sts on right needle and k2tog. KCGS complete. PCGS: Sl next st purlwise, insert right needle from top to bottom in purl bump on row below the slipped st on the left needle. Insert left needle point in back of first two sts on right needle and p2tog. PCGS complete. Round 2: P2, k2, *p2, k4 repeat from * to last 2 stitches k2. N1: Provisionally cast on 24 sts. Rw 2: Sl 1, k22. Turn. Rw 3: Sl 1, p21. Turn. Rw 4: Sl 1, k20. Turn. Rw 5: Sl 1, p19. Turn. Rw 6: Sl 1, k18. Turn. Rw 7: Sl 1, p17. Turn. Rw 8: Sl 1, k16. Turn. Rw 9: Sl 1, p15. Turn. Rw 10: Sl 1, k14. Turn. Rw 11: Sl 1, p13. Turn. Rw 12: Sl 1, k11, KCGS. Turn. Rw 13: S1 1, p11, PCGS. Turn. Rw 14: Sl 1, k12, KCGS. Turn. Rw 15: Sl 1, p13, PCGS. Turn. Rw 16: Sl 1, k14, KCGS. Turn. Rw 17: Sl 1, p15, PCGS. Turn. Rw 18: Sl 1, k16, KCGS. Turn. Rw 19: Sl 1, p17, PCGS. Turn. Rw 20: Sl 1, k18, KCGS. Turn. Rw 21: Sl 1, p19, PCGS. Turn. Rw 22: Sl 1, k20, KCGS, k1. Turn. Rw 23: Sl 1, p to end. Rw 24: Sl 1, k to end. N1 and N2: 12 instep sts. N3 and N4: 12 heel sts. Continue in rnds until foot measures 8″ Complete sts on N2. Slip sts from N4 onto N3. N3: K 23 sts. Turn. Start at Rw 3 of toe shaping. Turn heel as toe. Complete row 22. Redistribute sts as in toe. instep st. Continue in rnds until piece meas. 2″ from heel turn. Complete sts on N4. Beginning with P2, work k2, p2 for 2 inches. 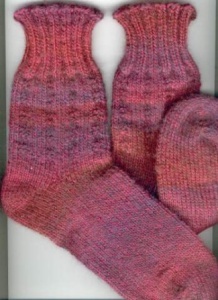 I row before finishing your socks p2 make a backwards loop and put on right hand needle. K2 make a backwards loop and put on right hand needle. Continue above to the end of the round. Do pull your backward loops snug. P2. pass the last p1 over the first p1, slip the backwards loop pass the last stitch on the needle over the backwards loop. Continue slipping the backwards loop and knitting the regular stitches and pass the stitch over the last stitch and off the needle. Remember the backwards loops are not knitted but only slipped from one needle to the other and the last stitch passed over. Work Second Sock if you haven’t worked both at once.